Found all along the northern borders of North West Province, and abundantly in the warmer northern area (Bushveld) of the Northern Province, as well as in the whole Lowveld area of Mpumalanga, across East Swaziland and in all the coastal areas of KwaZulu-Natal as well as the Eastern Cape Province's coast, up to the Eastern coastal area of the Western Cape. The Bushbuck may be a smaller antelope, but because of a ram's aggressive temperament when wounded, have earned the respect of many a hunter. It is a bit shy, always secretive and often missed by an tourist's because it keeps in the shady mountain bushes or riverbeds where it's black, red-brown and white colours makes it difficult to pinpoint the animal. Be alert when you are in the same surroundings of a wounded ram, because it will attack furiously, and can cause much harm with its strong horns. 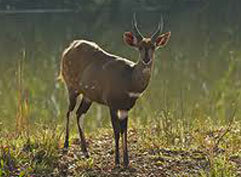 The bushbuck will, when it senses danger, sometimes bark with short, repeated intervals. It is most often spotted in the cooler part of the day (or in overcast days), when it will wander outside its hiding places. The bushbuck will not hesitate to plunge into the water to swim to safety, if necessary, but it's best defense is to stand dead still. It may then, if the hunter/tourist comes too close, suddenly accelerate with great speed out of its hiding place, causing the unaware to skip a heartbeat!